This is a tale of cold-blooded betrayal by a charismatic double agent and of monumental incompetence by his colleagues at MI-6 who sheltered, enabled, and defended him for several decades . Soviet mole Ken Philby (and associated traitors in “the Cambridge five”) wreaked havoc in both the British and American intelligence communities, compromising operations and costing the lives of hundreds, if not thousands, of people. 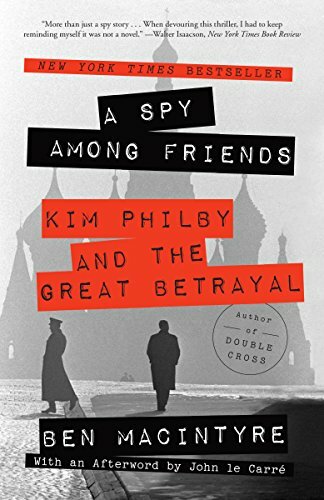 Ben Macintyre examines Philby’s career with a focus on his friends/dupes in the intelligence community, especially his closest friend and most loyal defender, Nicholas Elliott. Clearly, the authors had to wade through massive amounts of self-justification and obfuscation in writing this book, so we are getting a version of the story of which a definitive version is probably impossible. That being said, his presentation is convincing, well-sourced, and hangs together well. MI-6 is portrayed as an above-the-law “old boys club” that couldn’t be bothered to do serious background checks on “gentlemen” and refused to believe that one of their own class could really be a Soviet agent (even when presented with damning circumstantial evidence by MI-5 and the CIA). I think that the author was trying to be as nice as possible in his portrayal of Philby’s friends, but to me Nicholas Elliott comes off as a class-blinded moron and naive fool of the first order. After reading this, it is easier to understand the cynicism in the spy novels of Graham Greene and John LeCarré (the mole in Tinker, Tailor, Soldier, Spy is based on Philby). Overall, it was a fascinating book, though largely in a “can’t look away from the tragedy being brought about by arrogant fools” kind of way. It really is! …and apparently the spy game is still alive and well judging from recent events in Salisbury.